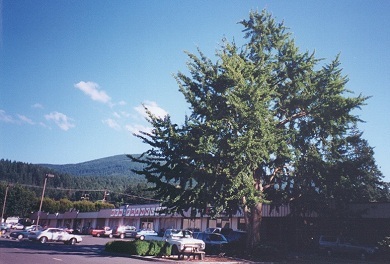 This well-known Ginkgo tree in Downtown Issaquah Plaza is located on the former site of Dr. William E. Gibson’s home. The tree was planted in the early 1900s by Gibson, who served as [an early Issaquah mayor]. For centuries, Ginkgo Trees have played sacred roles in Buddhist temple gardens. They have existed for millions of years, having served as food for dinosaurs during the Mesozoic Era (240 million years ago to 65 million years ago).